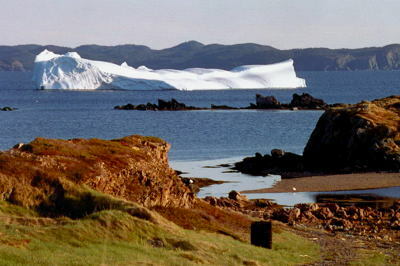 An iceberg has run aground in Back Harbour, Twillingate, May 2004. Newfoundland is one of the best places in the world to view icebergs. Each year an average of 250 icebergs drift along in the cold waters of the Labrador Current onto the Grand Banks, a route known as Iceberg Alley. Icebergs have been counted and tracked since the sinking of the Titanic in 1912. Although 250 is an average number, the yearly extremes have ranged from none in 1966 to 2202 in 1984. The best time of year to see icebergs is between the spring and early summer season, from April till June. Popular places to view icebergs are Bay Bulls, Witless Bay, St. John's/Cape Spear, Bonavista, Twillingate, La Scie, and St. Anthony. 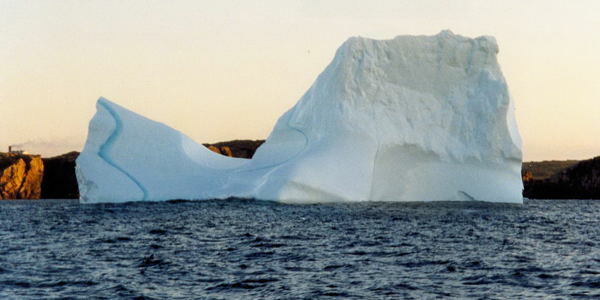 The icebergs seen off the coast of Newfoundland originate from the ancient glaciers of Greenland. These glaciers contain ice which is said to be between 10,000 to 15,000 years old. 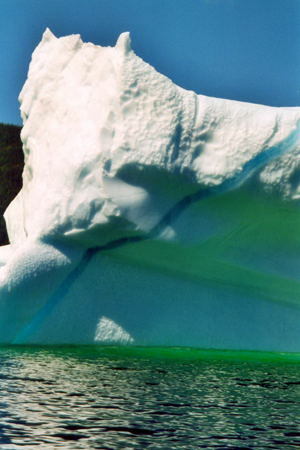 Iceberg near Conche, July 2002. Ice shelves from the glaciers break off in pieces and fall into the sea (a process called calving) and an iceberg is born. From here an iceberg begins its 2-3 year journey - ultimately southwards. They first head north - picked up by the currents and ushered into Baffin Bay where they will spend their first winter locked in by pack ice. Come spring and once the pack ice melts, the icebergs are released and are once again at the mercy of the currents that bring them through the Davis Strait towards the Labrador Sea and northern coast of Labrador. They will spend another winter trapped in pack ice off the coast of Northern Labrador in the Labrador Sea. They are released once again when the pack ice melts and finally make their way south along the Labrador Coast, then sail past the Atlantic Ocean coast of Newfoundland. 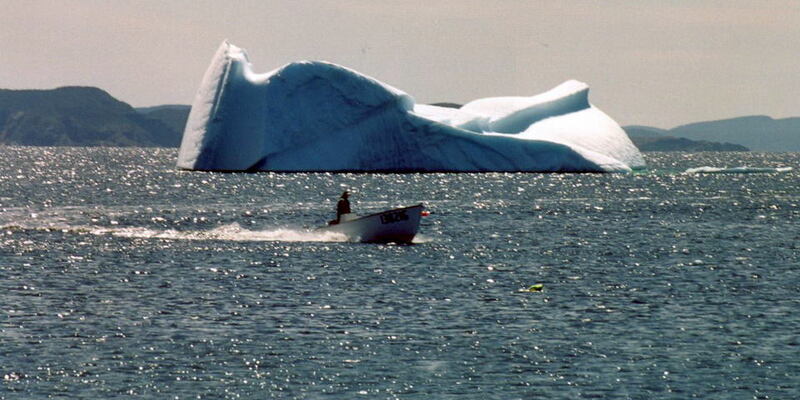 Iceberg near Twillingate, June 2000.